(Portland, Oregon) - On the evening of Monday, December 20, 2010, the Full Moon will slide through the dark shadow of the Earth and for 73 minutes the only light hitting the Moon will be the reddish glow from all of Earth’s sunrises and sunsets resulting in a total lunar eclipse. A free viewing of the eclipse will begin at 9:30 p.m. on the Oregon Museum of Science and Industry’s (OMSI) front plaza with the Rose City Astronomers Club providing telescopes for public use. Unlike solar eclipses in which the Sun's rays can damage the eyes, lunar eclipses are safe to watch with the naked eye. Please note OMSI’s public viewing is weather permitting. The total eclipse will end at 12:54 a.m. PST on Dec. 21 as the Moon exits the umbra. 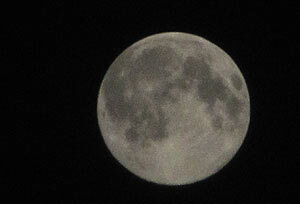 Then at 2:01 a.m. PST, the Moon will exit the Earth's umbral shadow and the penumbral eclipse ends at 3:04 a.m. PST. The eclipse occurs less than 24 hours before the winter solstice on December 21 at 3:38 pm. PST. The Moon will be situated in the constellation Taurus, close to the border with Gemini, and near the most northerly point in the Moon’s orbit at that time of the year. The penumbral eclipse begins at 9:29 p.m. PST and the umbral shadow takes a small, dark bite out of the left edge of the Moon starts at 10:32 p.m. PST. For 68 minutes of the partial phase, the darkness engulfs more of the Moon's disk as it slides into the shadow. The partial eclipse ends and totality begins at 11:40 p.m. PST and the point of the greatest eclipse occurs at 12:16 a.m. PST. The eclipse’s total phase will lasts for 73 minutes. The Moon will be 66 degrees above the southern horizon at the instant of the greatest eclipse. 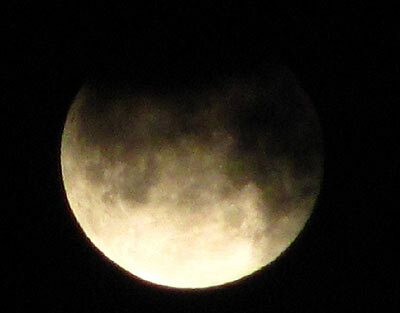 The next lunar eclipse for the Pacific NW will be a total on the morning of December 10, 2011 as the Moon sets.